The 25th World Family Therapy Congress and the 30th Anniversary of IFTA will be held 16 March - 18 March 2017 in Malaga, Spain. We invite you to join colleagues from around the world at the Congress’ Hotel ILUNION, near Malaga’s Cathedral. The 2017 Congress theme will celebrate the evolution of family therapy around the world. The Congress will focus on interactional methodologies for working with families and how those changes impact the families with which therapists work. The 2017 Congress, like all IFTA Congresses, will also feature many approaches to a variety of problems and ways of coping with them. The congress aims to help heal hurting couples and families in various cultures. Registration is open! 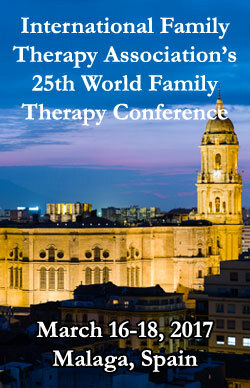 Click here to register for the 25th World Family Therapy Congress. Tell your colleagues! Click here for a flyer to post or distribute (PDF).